Fire resistant carpet that protects the floor from sparks and ashes caused during the combustion process in a chimney or barbecue. Its heat isolator property makes it suitable to use indoors and in wooden floors. 80 x 50 cm.120 x 50 cm. The carpet is edged with bies stip and tailored with fire resistant thread. Includes an elastic band to roll and storage. 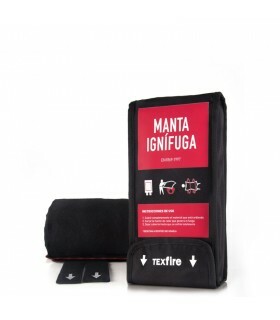 In an emergency case, is suitable to suffocate an incipient fire. Amazon . el día 2018-09-01 A great product. Exactly as described and looks to be able to do its job well. Costantino B. el día 2019-01-16 Tutto OK.